In the e-mail don't forget to type your phone number and shipping address. In the reply you will receive the visualization of your t-shirt. Our consultant will contact with you to confirm a payment method and the fact that our visualization meet your requirements. We will send you new t-shirt at the chosen address. The t-shirt costs 39€ + shipment cost. Take a good quality photo and send it to us on kids@cupsell.com. We will add some magic and change it to a t-shirt. We will make and send you the best and unique t-shirt, which was designed by you, your kid or your beloved cat! Which size can I choose? We have unisex t-shirts for adults and for kids. Unisex means that there is one unified type of t-shirt for both sexes. Kids size table is shown on the lower-left size, adult size table is available on the lower-right side of the screen. How long do I have to wait for dispatching my order? Production time takes up to 5 working days since the day of sending a confirmation e-mail. How long do i have to wait for my confirmation e-mail? Our consultants are working since 10 AM to 6 PM on every working day (Monday-Friday). The response to an order can be expected within few hours, and no later than 48 hours. What about the quality of my photo? The photo quality should be the best as possible. :) But seriously, 5 megapixel photo should be enough. Most of the modern cellphones has that type of camera. Is it important? Very! Better quality means that there will be no blur, etc. It will give us a better opportunity to redesign the project of your Little Artist and print it on shirt. Do I have to log-in? No! The whole ordering process is based on e-mail and phone communication. It's super-handy, because you don't have to register, fill up the forms or confirm your account! You only have to send the photo of a t-shirt project on kids@cupsell.com and wait for a reply. Can I send the photo of any type of drawing? Here is the crucial element. The shirt needs to have a colored background. It is important to explain that the background color looks much better and that is technologically impossible to use the white background, because some shortcomings could appear on the uncolored parts of a shirt. Is there any guideline for drawing a t-shirt? There are no strict rules, but we have some advice. If there is any element that just need to be on a t-shirt, we suggest placing this kind of special element of the drawing somewhere outside of the edge (of a t-shirt). The print technique is the cause. During the creation process, project is slightly enlarged (ca. 2 cm), to cover whole shirt. It means that some details which are somewhere near the contour of the tee could be cut away. 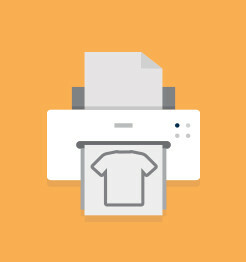 To make a t-shirt, we need the filled template form which can be sent only by mail. Giving the phone number is important, since our consultant can have some additional questions regarding your order. What do I need to write in e-mail? You only have to type your address, phone number and add a mail attachment with filled template form. What do I need to write in template? - give us your phone number. Are my shirt machine washable? Can I iron it? Of course! Our shirts are durable even in high temperature wash setting. But for the best permanence of a print (which is the most valuable element of your shirt) we suggest washing the shirt in 40 Celsius setting. Shirt should be ironed inside out. How are those t-shirts made? Our t-shirts are made in Poland out of nice polyester-cotton mix. Inside is made of cotton and outside is made out of polyester. Cotton lining gives the needed comfort and the polyester adds a smooth feeling. You can pay for your order in advance by bank transfer or via PayPal.